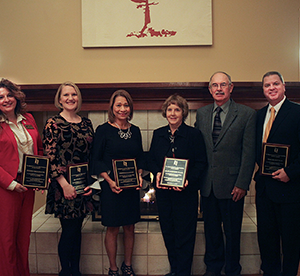 On November 8, the Highland Community College Foundation recognized six individuals as Distinguished Alumni during the annual ceremony held at the Freeport Club in Freeport. This is the 24th year the awards have been presented to individuals who have shown community leadership, made their start at Highland Community College and believe in the mission of higher education. Including these new recipients, the Highland Community College Foundation has recognized 130 individuals have been recognized as Distinguished Alumni.